Though technology has advanced a great deal, there is something to be said about keeping physical records. Double Rivet shelving is designed to provide an economical solution for the storage of file boxes. Assembly is simple and installation can be done without special tools in a minimum amount of time. All steel parts are finished in an attractive Light Putty baked enamel. 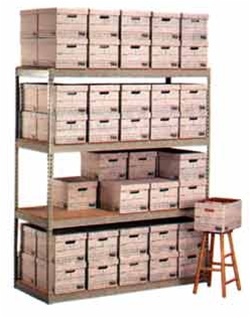 Record storage units will aid in records management by providing an organizational solution to high density archive storage.